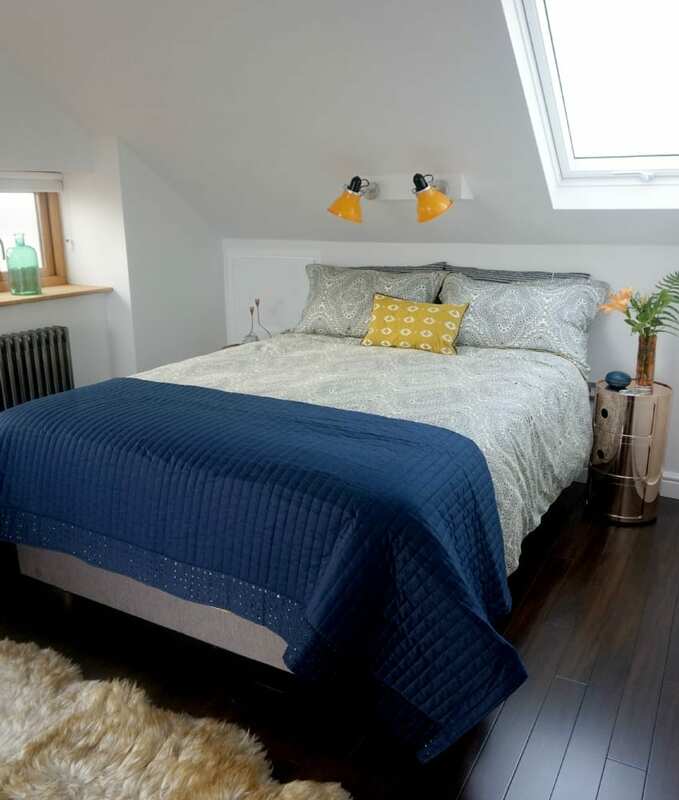 Today, I’m giving you a peak into our newly built, decorated and furnished attic bedroom. The builders are still here, but we have this one room pretty much done now, and before I do a full room reveal next week, I wanted to show you my bed. It’s a bed fit for a king… and a queen of course. And I’m totally in love with it. 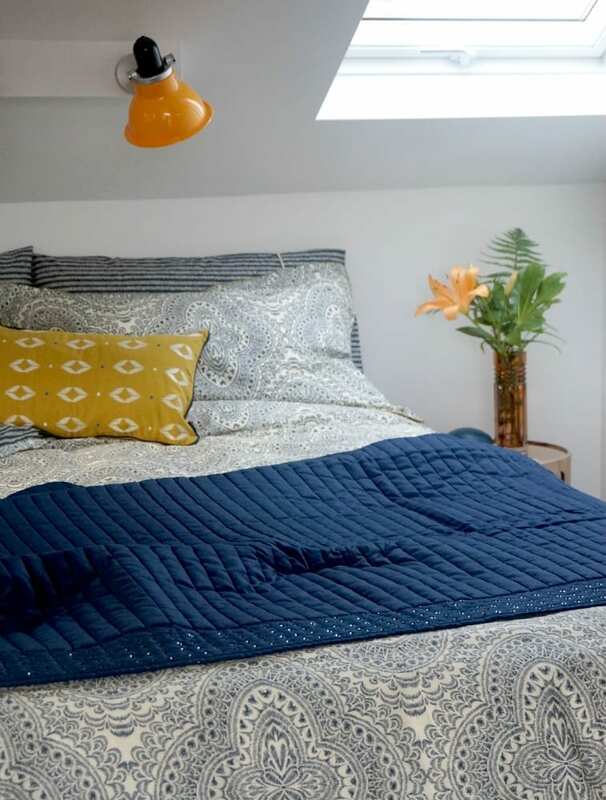 The bedding is a new addition to the AW15 collection from Bedeck Home called Bedeck 1951. 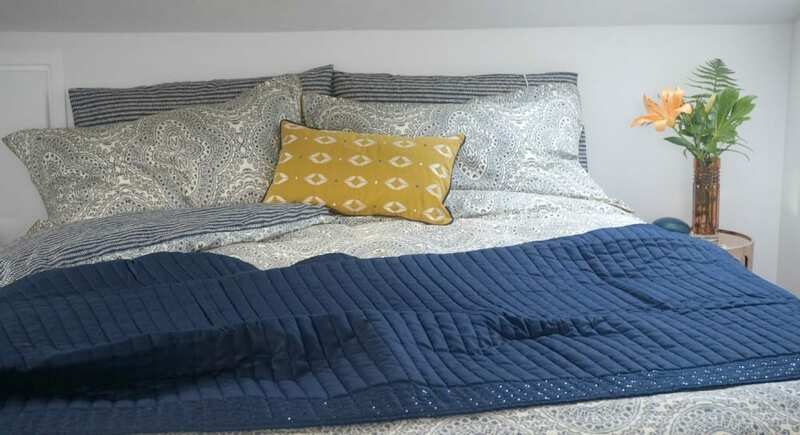 Ziba in Navy consists of the stunning reversible duvet cover, large print one one side, the smaller print on the other, either standard or oxford pillowcases in both prints, a gold cushion and the beautiful navy bedspread. The bedding is made from 100% cotton sateen and is soft, warm and yet cool too. It’s incredibly comfortably to sleep in yet doesn’t look messy in the mornings. Making the bed is a joy – now there’s a sentence I didn’t think I’d ever write. It feels very luxurious, almost decadent and the print looks stunning in the new loft bedroom. Because I’ve kept the walls minimal and neutral I knew I wanted to add a little colour with the bedding, and this suits the scheme beautifully. But what about the bed underneath, well here it is. It’s from the Pocket Spring Bed Company, as part of their collaboration with the National Trust. 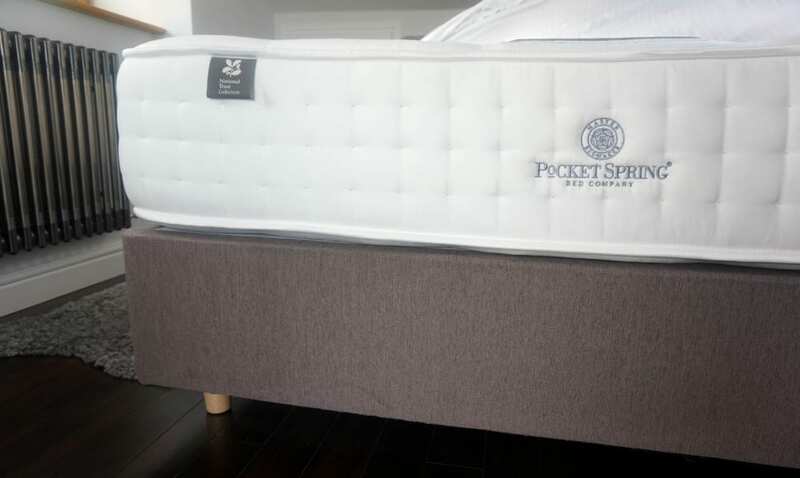 As part of the Silentnight group, the Pocket Spring Bed company partnered with the National Trust to create a range of hand crafted beds and mattresses. The new bed collection is inspired by the gardens and grounds of properties within the Trust’s care. 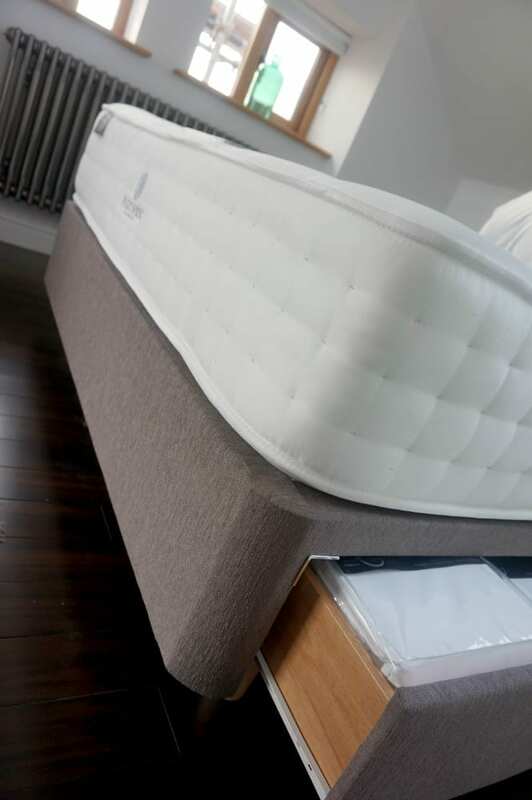 The hand crafted divan bases and headboards come in a traditional design and are available in a range of fabric colours, and three comfort options. 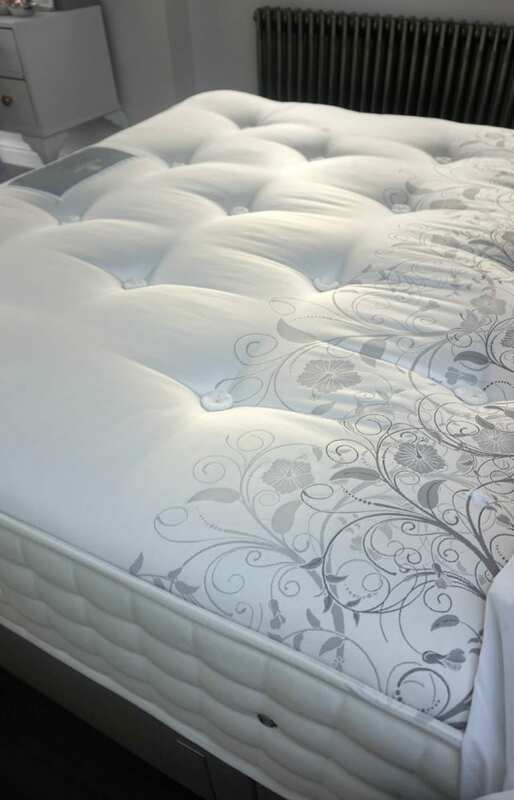 The mattress you see here is the Purbeck 2800, a combination of 2800 premium pocket springs with a cashmere filling that gives a medium support and excellent comfort. Finest cashmere fillings providing exceptional luxury. Luxury divan with optional storage and premium fabric solutions. Traditional soft hand tufting for long lasting support. Double sided mattress with suitcase style handles and 16 vents to allow air to circulate freely. 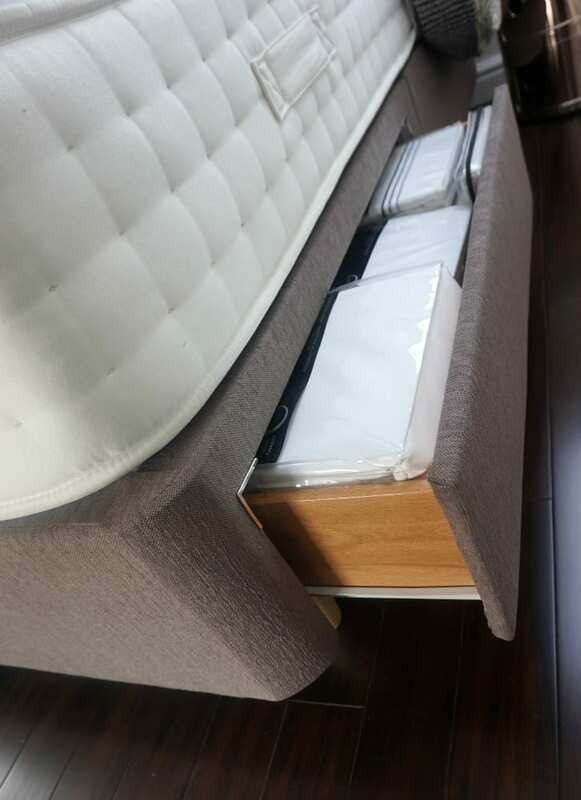 The base, which we purchased to go with the review mattress above, is a King size slimline divan with two drawers. Whilst the blurb on the site says this range is traditional in style, I actually find them quite contemporary and love the way it looks in our room. 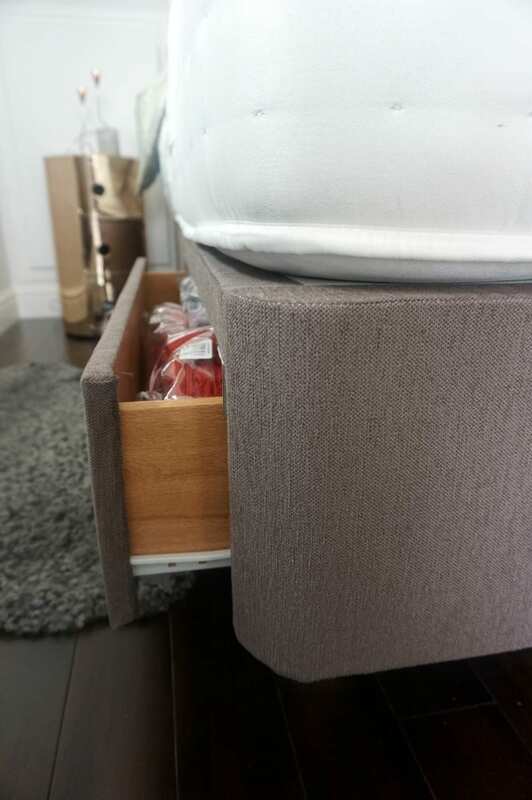 The legs elevate it from the floor, giving more of a frame style, allowing storage under the bed too if you wanted to use it. You can see from my images how we’ve made use of the drawers already, and although they’re not as deep as a usual divan, they still hold all the spare sheets and towels for our room. 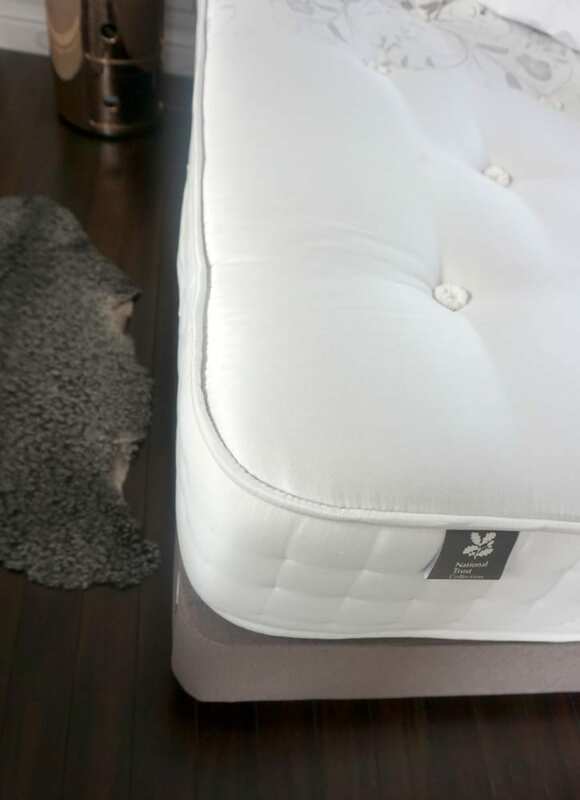 It really is a beautiful bed, and I’ll be back in another post showcasing it in more detail, letting you know how we feel about it once we’ve slept on it more. All I can say at this stage is it looks great, fits the room well, and is very comfortable and firm. To find out more about the bedding, do take a look at the Bedeck Home website HERE. And if you want more information on the Pocket Spring Bed Company and their National Trust collaborative collection, click HERE. This page here will give you more information on where to buy. Disclosure: The bedding and mattress were gifted but all comments and opinions are genuine, honest and my own. It’s looking great, I can’t wait to see it completely finished! Thanks Natasha, fingers crossed the big reveal will happen next week! Looks lovely Jen – I like the orange task lights very much! Thanks so much Kate, yes those lights are fabulous aren’t they. Oh it looks so lovely, I love the colours you have choosen too. Those little lights are a great idea, keeps the bedside tables clear of lamps too. Thanks Steph, I fancied bright pops of colour in here, and you’ll understand why when you see the rest of the colours I’ve used. Thanks about the lights, had a long fight with builders and electrician over them! Sings in Disney fashion: ‘It’s a whole new room! 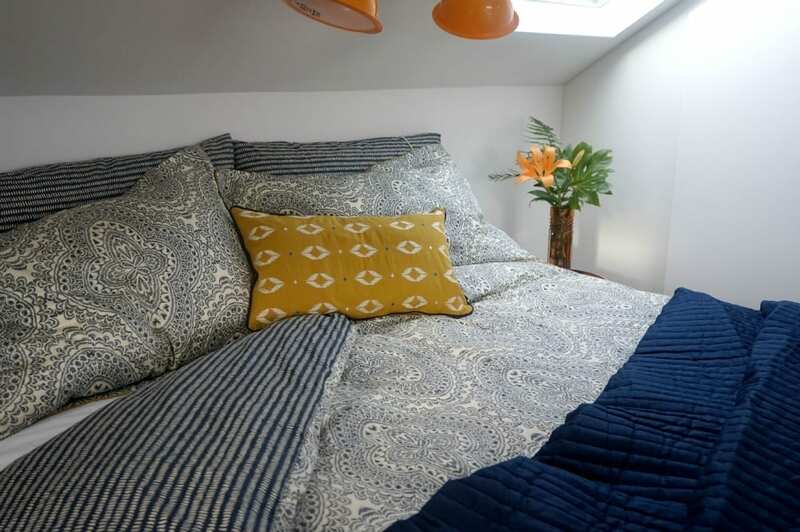 A new fantastic point of view’ Love it all Jen, love the fact the bedding doesn’t crumple and the gorgeous pattern. I love having our bedroom on the third floor, it feels like such an escape. Just beautiful! It looks really amazing Jen! Love the everything, and I think you’ve styled it beautifully. The bed look incredibly well made! Oh wow Jen! What a lovely space. Can’t wait to see the rest of the room. That bed looks ever so comfy and I really like that bedding too. It’s looking good, Jen – at least now you’ve been able to get down to the fun bit of decorating it and adding interiors! I could just dive into that bed. The mattress looks so comfy. Attic room is looking great! Can’t wait until I can afford to do mine in a few years. Love the roof window – but I am biased! Do you find the white frame helps makes your room feel brighter than a pine finish frame would? Hi Emma, thanks for the comment. Yes I love the white frame, and didn’t want the wall/roof broken up by the pine finish. I’m really pleased with the decision. Great blog, love the design of this room particularly the bedding.